All participants had to leave the bivouac in the early morning even before sunrise to join the start of a final fling. After 230 kilometers of liaison, it is on the beach on the shores of Lac Rose that they started for 22 kilometers. A final boost to celebrate the end of the competition before taking the podium to end this 10th Africa Eco Race. Reward for some, deliverance for others, this last day was celebrated in the middle of a crowd where locals and the entourage of some competitors came to enjoy the show. Mathieu Serradori and Fabian Lurquin (FRA-BEL / MCM) opened the show by crossing the finish line ahead of all the cars to blow the dust one last time by slipping 360 degrees in front of the public. A final battle with Dimitri Vasilyev and Konstantin Zhiltsov (RUS / MINI) on the beach before enjoying their final victory. The big winners of this edition were congratulated by the number one motorbike rider, Paolo Ceci (ITA / KTM) while Gerard De Rooy (NL / IVECO), winner on truck category, congratulated Tomas Tomecek (CZE / TATRA) for his 2nd place. Everyone had a smile, happy to be reunited one last time to celebrate their adventure. The traditional parade on the podium allowed the drivers to pay tribute to their staff by getting them up for a photo shoot and a champagne shower. A little further, the spectators could approach the vehicles queuing, some children have even been able to get inside some cars for a photo. Jean-Louis Schlesser and René Metge also had a big smile on their faces, delighted that this new race went so well. Jean-Louis was even already focused on the next edition: "we already have registrants, and seeing the joy of the Dutch this year, it should grow fast." As much on the side of the organization as competitors, the slogan was the same despite fatigue: "Heading for next year! ». This one deserves to become a legend. 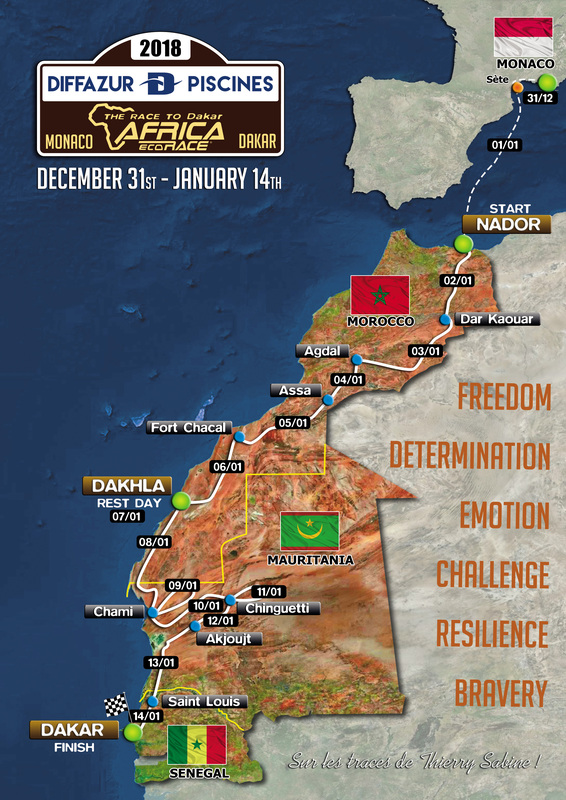 Tomas Tomecek (CZE / TATRA) has achieved a feat by reaching Dakar alone in his truck from Monaco. More than 6,000 kilometers later, the triple winner of the event manages to finish his 8th Africa Eco Race in 9th place. He braved the dunes, came out of complicated situations without help and took up the crazy bet that he embarked on to spice up his race. He finished 2nd in the trucks behind Gérard De Rooy (NL / IVECO). "I'm happy like a child, it's a dream come true," he said just behind the podium at Lac Rose. Jean-Hugues Moneyron and Thierry Maury (SEN-FRA / CF MOTO) will have reached the end of their goal. This crew of Team Dakar dreamed of joining their city in Senegal by overcoming the race with their SSV. And yet mechanical problems at the end of the first week had complicated things but the motivation and determination of the team composed of two other crews led them safely. They finish 15th in the event and were received as heroes in the country. Special mention to Jean-Claude Ruffier and Jérome Bos (FRA / CAN AM) who take 26th place with the oldest driver of the event. At 78, he finishes his first rally-raid ... it's never too late! They were nine to embark on the adventure in "malle-motos". These riders who receive no assistance but just a trunk transported by the organization are often those who sleep the least on the bivouac. Thus they find every night the minimum necessary to reach Dakar and are left to themselves to take care of their mechanics. Among them, Jonathan Blackburn (GBR / KTM) achieves the best performance by taking the 5th place. This morning he was relieved to finish and was especially eager to recover with a good night's sleep. Nathan Rafferty (USA / KTM) finished just behind but won the title in the veteran category. This team still has a bright future. Pal Anders Ullevalseter (NOR / KTM) is already experienced at the age of 49 and with two victories in the Africa Eco Race, even if he intends to return to wipe his failure this year, the Norwegian has decided to talk youth. As a national coach, he has selected two young drivers to join him on the adventure of the African desert. Felix Jensen and Marius Helmersen are 26 years old and have participated for the first time in their young career in a full-scale rally. The Norwegian succession is ensured with the nice 4th place of Felix in the overall classification. A performance all the more remarkable since he had an eye surgery to treat his vision problems and took a year to recover. The three team-mates are now looking forward to coming back next year to let their experience talk.